I got the opportunity to meet up with Ford Fiesta Movement Agents Brad and Emma today for a test drive of the 2011 Ford Fiesta before our Third-Annual Mt. St. Helens cruise. Although the weather didn't make for great viewing of Mt. St. Helens, it was a perfect day to take a Fiesta out for a spin. Here are some thoughts after seeing and driving Ford's highly anticipated soon-to-be-sold-here subcompact. Exterior styling is always subjective, but I think the Fiesta looks great. It's got great lines, a bold design, and is far from bland. It's abundantly clear that this is not an econobox. The Fiesta has projector headlights, fog lights, LED taillights, side-marker turn signals in the mirrors, and great-looking 17" alloy wheels and 205/40/17 Pirelli tires. 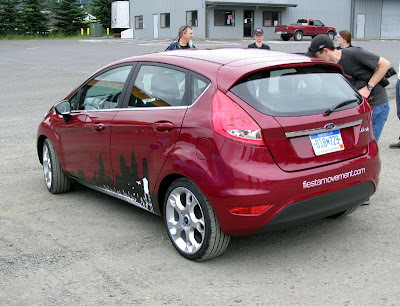 The Fiesta Movement vehicles also feature unique graphics. Let's just cut to the chase: The Fiesta's interior is fantastic—not only for a subcompact, but for any car—and it's anything but plasticy. The dash is made from soft-touch material and the silver bits and pieces are of high-quality. And it just goes on from there. The seats are comfy with decent bolstering. The ergonomics are great; everything is within reach and feels like it's where it should be. The gauges are easy to read. This vehicle has Bluetooth and a voice-recognition for things such as climate control. I'm told the U.S. versions will be available with Ford's Sync. For folks sitting in the back seat, there is a good amount of leg room and it is comfortable. Cargo space is plentiful behind the rear bench. There's a lot more space there than my Yaris; it's probably similar to the Honda Fit. Of course, driving is the most important aspect of a vehicle, and the Fiesta continues to impress on the road. The first thing I did was make a complete circle, and determined that the turning radius was very good. Another nice thing: A fat, chunky steering wheel. The 1.6-liter engine provides the Fiesta with good acceleration. The car doesn't feel underpowered and the engine feels and sounds refined, even at higher RPM. 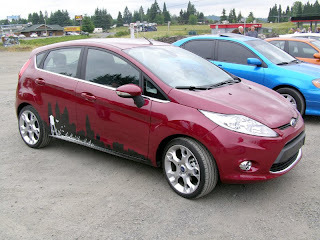 According to Brad and Emma's Web site, their Fiesta is getting about 30mpg combined. 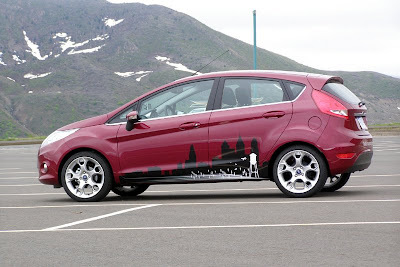 Brad also said the Euro-spec Fiesta runs on premium fuel, although, the U.S. versions will run on regular. Being a stickler for good shifters, I'm happy to report that the five-speed manual gearbox shifts very nicely; definitely among the best in the subcompact class. Shifts feel accurate and precise; throws are very adequate. The ride is surprisingly good for a subcompact, even for a car with the 17-inch wheels and low-profile tires. Again, I had four people in the vehicle during the drive, and it never felt jarring or uncomfortable. The Fiesta has a fairly narrow rear window. However, outward visibility was still good. It helps that the rear C-pillars aren't terribly wide. The thing I am most impressed with about the Fiesta is its synergy. All the parts work well together to provide an excellent driving experience. The steering feels quick and responsive. The car rides well. The powertrain feels refined and smooth. The controls are where you want them. It all just comes together. And although small, the Fiesta doesn't feel cheap or tinny—it feels solid and substantial—a great thing in a small car. Assuming the U.S.-spec Fiesta retains the same quality feel and excellent driving dynamics of the European-spec Fiesta Movement cars, Ford will, without a doubt, have a top contender in the subcompact market. It's got the right fuel economy, the right size, and will hopefully have the right price, too. The Fiesta is selling like hotcakes in Europe, and I can see why. However, convincing Americans to buy subcompacts can be difficult. With that being said, the Fiesta is an excellent option for those who do want to buy small and also want to buy American. I've been looking at "vintage" Fiestas online lately. Yes, they were pretty cool little cars, too. With regards to the new Fiesta, I'm really impressed with the vehicle. From my time in the car, I can honestly say that it is as good as the other reviews are stating. I sincerely hope that there isn't much that's "lost in the translation" when it comes to the U.S. because as it is now, it's great. Ah, so it's shorter than the Yaris but longer? The Yaris looks cute, but the Fiesta looks fast. I really like the Fiesta's design. I hope they don't skimp too much when they port it over. In fact, the less they change the better. That's it...gonna have to part with my Yaris I think. I'm in love with the Fiesta. I'm quite envious of your test drive. The interior looks damn sharp! And as I've said before, I think the outside is beautiful. 'The Fiesta's interior is fantastic—not only for a subcompact, but for any car." That's a bit of a far reach. no? No, it isn't a stretch, Dominic. It really is a damn nice interior. It's not a luxury car, but it's very well constructed. For instance, as much as I love my Yaris, the interior is admittedly plasticy. Ever sat in a Kia Optima? Plasticy. A Cobalt? You guessed it, and the list goes on. The Fiesta has a genuinely nice interior regardless of market segment. Great write up! Ford sure is coming a very long way to really improve their vehicles, can't wait to drive one myself! It's good to see that American car companies can indeed create a good small car. And I meant the Yaris is taller (vertical wise) but shorter (horizontal wise). I have no problem if they build them in Mexico, so long as the quality is good. I hate to say it, but Ford's past history is bound to repeat itself. I'm willing to bet they'll cut corners when the Fiesta reaches the U.S. If they manage to maintain any of the European model's positive traits, rest assured, they'll find a way to erase them in due time. 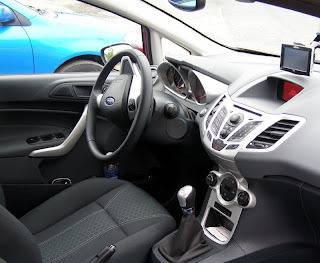 Case in point, the changes to the dash in the current U.S. model Focus compared to the original. They switched to cheap, hard plastics and changed the design so that it's (almost) as exciting as a bowl of cold oatmeal.